There are multiple steps that every flier can take to prevent the spread of bacteria when they fly. First, they should travel with and use an alcoholbased hand sanitizer. They should also travel with a small pack of disinfectant wipes. So does using a tissue or a paper towel to open bathroom doorknobs and touch toilet handles. The most vulnerable area may well be your eyes, and medical professionals advise not going anywhere near them with your hands, as tear ducts are a fast route for germs to the nose and throat. 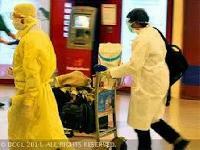 There have not been any reported cases of the Ebola virus spreading within the confines of an aircraft cabin. Ebola is not an airborne virus but is spread through blood and body fluids. But airline passengers should adhere to rigorous hygiene practices to limit exposure to the virusEbola can be transferred through open wounds and mucus membranes such as the mouth and eye, . Wash your hands often and use alcoholbased hand cleansers. If you travel to or with people who may have come from Ebolainfected areas, watch your health for signs and symptoms of Ebola for 21 days after travel and seek immediate medical attention if required. An aircraft is actually cleaned is something of a secret. Removing trash and old magazines is one thing, but most industry watchers say that a proper cleaning doesnt occur that often. The FAA doesnt regulate or inspect aircraft cleaning, so frequency and thoroughness are left up to the airlines themselves as a rule of thumb, an aircraft is supposed to be completely wiped down after every 30 days of service or at 100 flyinghour intervals. But in theory, that means that an aircraft can be used for dozens of flights between deep cleanings. Aircraft are short on creature comforts, so its mighty tempting to grab a blanket and a pillow when boarding, one of the last free perks of any flight. But the sage advice is and no one is changing the pillow cases.Bringing you own neck pillow is a much better idea, but cautions that you should use one that can be laundered, because it can transmit germs as well. The cabin air is fine and aircraft are outfitted with HEPA filters to clean it. The real problems lie on the chair upholstery, the tray table, the armrests and the toilet handle, where bacteria such as methicillinresistant Staphylococcus aureus (MRSA) and E. coli can live for up to a week on airplanes that arent properly cleaned. However this is not how a hole behaves. It creates a decompression, as the barrier between the different pressure levels has been broken. After the decompression it s pretty safe, unless you stand too close to the hole. Drink on a plane is said to make you more drunk than having the same drink in the bar. Research was carried out in order to reveal the truth behind this myth. The studies unveiled that levels of alcohol are the same. But it can make your hangover worse as air travel dehydrate you as the alcohol does. The oxygen masks pops out of the ceiling when the pressure in the cabin is lost. 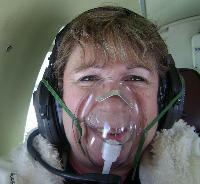 Oxygen masks doesn t have more oxygen than a normal air, they are made for you not to pass out during decompression. Planes have underfloor filters which are designed by the manufacturers to capture between 94 and 99 percent of airborne germs and viruses. Not to mention that Air on a commercial jet is rumored to be very polluted t total change of air occurs every 23 minutes . Having the window open allows a passenger to see what s going on outside in a split second and it s not only because the window is opened. Say imagine if the plane crashes and the windows then just automatically open on its own leading way to a ray of bright sunlight coming into the passenger cabin. For a few seconds, all the passengers inside won t be able to see anything outside until their eyes adjust to the bright sunlight outside. That few seconds in the case of an emergency is crucial.